Where Real Salt Lake fans come to keep it real. Here is our second update from camp – this one coming from veteran Robbie Russell who had an eventful start to the preseason just trying to get out from the east. Much appreciation to Robbie and the thoughts he has shared with us below. We’ll look to hear from both him and Justin Davis one more time next week as the team wraps up the Arizona portion of camp. Enjoy! Keepin’ it Real learned earlier today that Jamison Olave did not make the trip. David Horst will be filling in at center back. We were asked to sit on this info until lineups were released prior to game time. This decision was two-fold: 1) with Olave’s physical style of play this is being done out of precaution to ensure that he doesn’t pick up an injury on the turf and; 2) Horst showed the most impressive improvement in preseason and has continued to impress in training. Although it was not mentioned, I assume that the fact that RSL is playing a less-than-lethal NYRB may have made this a good opportunity to get Horst some first team experience. In addition to this, Robbie Russell will be starting at right back in place of Tony Beltran. This adds more experience along the backline and surrounding Horst. What are your thoughts on this development? Duncan Oughton and Alejandro Moreno are expected to be available for tonight’s match after having national team duty earlier this week. Neither are expected to start. Frankie Hejduk is not expected to be available for the Crew after playing the full 90 last night for the US. 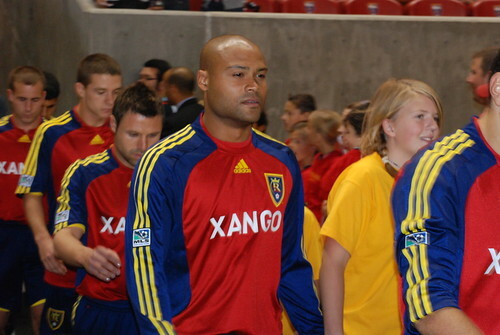 Both Robbie Russell and Luis Escalada are both available for selection to the 18 for RSL. My suspicion is that both will be in the 18, but that neither will start. However, if Beltran struggles again early on, look for the early hook and Russell to enter the match. Ian Joy appears to be out 4-6 weeks due to a hamstring injury that has been bothering him all preseason and was re-aggravated during the match against the Aztex. Borchers has also been suffering from an injury to his ankle from the bone spur surgery that he underwent in December. However, he played in the Aztex match and appeared to be moving fine. Robbie Russell appears back to full health and could be in the mix as well. I’m okay with this lineup, but I could also see a couple of alterations as the season moves along. First, although Findley and Movsisyan appear to be clearly the best two forwards at this point, I wouldn’t mind seeing Findley come off the bench in certain matches. Not only do I like the concept of Findley bringing his pace in against the legs of tired defenders, but I think Escalada provides something that Findley and Movsisyan don’t. He is a more technical player and can get into the mix of the tight passing game that RSL employs through the midfield. From my brief observations in Charleston and at practice, Escalada shows signs of being a precise finisher (although we didn’t see that against the Aztex). Like most people I’m not sold that he can do it in this league, but I’m ready to see him in some real action. Second, I am torn between Ian Joy at left back or Tony Beltran at right back, with Wingert sliding over to the left. I like Ian’s grit and experience, and he’s a great professional to have out on the pitch. However, Ian doesn’t have a lot of pace and seems a little hesitant at times to push forward. Beltran on the other hand is inclined to push forward at every chance. This can be good, or bad. He can get caught out of position, but his pace and recovery ability can make up for his occasional defensive lapses. We’ll see how Beltran does during the first few matches of the season. Ned Grabavoy – it didn’t seem like he was really fitting in yet with the group in Charleston. I’m curious about what contribution we’ll see out of him this season. Andy Williams – I assume that we will see a similar reserve role out of Andy where he comes in late in matches to either help close out a game with his ability to help the team hold the ball, or in pressing for a goal. Robbie Russell – a talented player, with a lot of good experience. I think he’ll play a lot this season in fill-in roles, but he doesn’t have a designated position which may keep him from being a regular starter anytime soon. Real Salt Lake managed to eke out a victory against the host team, Charleston Battery in each teams second match in the Carolina Challenge Cup tourney. The play by the RSL side composed mostly of reserves in the first half was rugged, and the USL-side at times looked the more polished of the two sides despite only having practiced for a couple of weeks together. Clint Mathis seemed to hold his own, and managed the first goal off of a free kick that glanced off of the wall and snuck past the keeper. Trialist Joe Zewe, who has played at Viborg alongside Robbie Russell, and nearly joined Ian Joy at St. Pauli, looked very dangerous and created several opportunities for himself but could not connect. The Battery then pulled the game level in the 2nd half as standout Ian Fuller blasted a perfect shot to the upper left side of the net as RSL keeper Chris Seitz had shaded heavily to the opposite side of the net. The play throughout the first 70 minutes was choppy and relied heavily on long passing. However, in the 70th minute Coach Kreis made wholesale changes bringing in many first-teamers including Will Johnson, Yura Movsisyan, Kyle Beckerman, Chris Wingert, Jamison Olave, and Javier Morales. The results were immediate as the style changed to the tight passing, fluid, energetic tempo that we became accustomed to from the MLS side last season. It took just 7 minutes for a result to be posted on the scoreboard as team captain, Kyle Beckerman blasted what looked like a hopeful 35-yard volley into the net which proved to be the game winner. A short time later, the RSL staff held their collective breath as last years breakout striker, Yura Movsisyan went down hard and awkwardly in the box on his left shoulder. He later re-entered the game and initial reports are nothing serious. Likewise for defender Ian Joy who left the match earlier with some tightening of the hamstring that troubled him last season. Here is an update from training camp. I wanted to especially focus on how the roster looks to be sitting with the impending contract/budget compliance date coming up for the league on Monday. I will also post something later on that analyzes how I think the roster will look come March 28th. The team is looking good. It appears that at this point the focus has been on the same diamond 4-4-2 formation that we saw last season. The returning players appear to be very comfortable in these roles. There is more of a focus on wing-backs with Beltran, Joy and Wingert filling in out wide. Speaking of Beltran – one observation is that he is vastly improved. Look for him to be a contributor this season. Cox – I heard some comparisons to Tony Beltran from a season ago. A quick player that can play left-back or left-wing. Has a good soccer knowledge, and a high confidence level. Seems to be adjusting well to the pro level, although there is definitely still a learning curve. He’s more of an attacking player than Beltran, but look for him to make the roster. Alexandre – No updates on him, but since he is already signed by the league, he’s a lock to make the roster. Escalada – As reported earlier, his fitness is improving. The team reportedly likes his finishing ability (despite the missed PK). Look for him to move on in the game of Real Salt Lake Survivor and stick with the team through the Charleston Tournament. St. Preux – Again a marginal, developmental player. I’m guessing it’s a long-shot that he’ll make the team, especially if the team is high on Escalada. If he makes the Charleston roster it will be a minor surprise. El Khalifi – As reported yesterday, the team is still active in negotiations with him. I assumed that there was a big rush to get him in for the last few weeks of pre-season. I’m sure they’d like to do this, but also don’t write-off the possibility of him joining at a later stage (either prior to the April 15th window close or even during the summer window). I think the bringing in of a left-sided midfielder in Salazar is an indication that the team is looking for an insurance policy at this position. Clark – No update on this player (as keepers tend to be off in their own little world during practice), but I think we’ll know all we need to know by next Wednesday. I would be surprised to see the team take 4 keepers to Charleston. Morales– has a minor injury, and is being held out largely for precautionary measures. Unknown at this point if he will play in the exhibition tomorrow. Nunez – recovering from surgery. Borchers/Russell – Both appear to be back at around 90%, and are participating fully in practice. Robbie is coming off of recent shoulder surgery (rotator cuff) that he had done here in Utah. He is not supposed to have contact for 4 weeks, but can participate in light practice. He isn’t sure what happened to cause the injury, but indicated that he did receive an elbow in the back during the NYRB game (if I recall he came off the pitch for this). When asked about his role this year, he indicated that he is hoping to play in the midfield this season. The captain of the team indicated that this team should get out of the gate much more quickly this season. He also indicated that he is okay if the team asks him to play a holding role (although its too early to know if this will be the case), as long as the team is scoring. He said that if the team isn’t scoring he’s going to be up the field and in the mix of things. Good attitude if you ask me. I think you’ll like this kid. He explained that he grew up in South Africa, and was playing soccer at the college level there, when he was discovered by Alabama A&M. He is confident about his ability, and claims that his age is a positive, because he won’t still be learning and developing like some of the younger ones. He has a bit of a Jar Jar Binks quality to him. You’ll see. This kid has a good head on his shoulders. He describes himself as a left-sided player with quickness and good crossing and passing ability. He also likes to tuck in, which will suit him well in a Kreis coached midfield. He understands the need to step it up at this level. He has high expectations for this season. He is focused in making sure that the team improves “in all aspects” this season. He doesn’t feel that new additions are required to improve, but just being together and building consistency should help. In particular, he thinks they should be much more successful on the road, particularly early on. He doesn’t feel that the stadium will dictate tactics, but the quality of the players that they have going into the season (i.e. new additions) may dictate tactical changes. Is rooting for Arizona in the Superbowl. It seems Larry Fitzgerald was on his fantasy team. Also explained that his buddy Ben Olsen is still feeling pain, but is going to try to give it a go this season. Would welcome the opportunity to play on his natural right-side, but doesn’t mind playing on the left. Played with KOA (Osuwu-Ansah) with Canadian YNT. Indicated that he is a very talented player. He needs nurturing, and needs vets to show him the ropes. He’s very atheletic and with some coaching and mentoring can be a very good player in this league. Had much more down time this offseason than last. Is looking forward to hopefully getting some starts this season. Was disappointed that this didn’t happen last season. Several players made similar comments: Looking forward to having a preseason with this team. Hoping that the team can find a way to get developmental players some game action. Confident that the team will be able to take a step forward this year. Olave, Viveros, Wingert and Owusu-Ansah were not present. Olave had some visa issues, but is expected to arrive soon. Viveros and Owusu-Ansah are also expected to arrive soon. Wingert of course is in camp with the National Team.